Amandine Gay, afro-feminist actress, researcher and filmmaker takes a moment to talk about her new feature-length documentary, “Speak Up/ Make Your Way (2016)” (original title: “Ouvrir la Voix” in French),which documents conversations with 24 black afro-descendant women living in France and Belgium. The film simultaneously addresses the diverse identities and similar experiences, in some cases trauma, of black women in Western and white supremacist spaces. AWID: What led you to a career in filmmaking? Amandine Gay: I was writing a lot. I really wanted to do something creative. I was 23 years old when I told myself I’d try theatre, to perform. I was accepted into the conservatory of the 16th arrondissement of Paris and went to Paris to pursue theatre. I really enjoyed it—I love acting too, as much as writing. But soon after, I faced the racism of the French film and theatre industry. From that moment, I went back to writing because I was so frustrated as an actress. A friend who was a casting director told me I would never get the parts I wanted, unless I wrote them myself. That’s how I came back to writing. I wrote shorts. I was hired by a production company at the time to create shows, but it was complicated. In the beginning, they found us fresh and new, but in the process of writing they would give us problematic feedback, for example, one series we developed was about five girlfriends in Paris working for a feminist magazine—a feminist project you don’t see much of. We had projects that never saw the light of day because I didn’t want to rewrite my black characters as token stereotypes and, in the end, we never agreed with the producers that hired us. After spending 2-3 months in the French film and theatre industry, and having also quit my share of projects because I couldn’t get them to understand that a line in a script was racist or sexist, or that I didn’t want to interpret a part in a certain way because I was the only black person on set…. But I think what really shook me was being told that I didn’t exist. But, I’m not the one who gets to decide, it’s the producers who have the money. So, if I’m forced to re-rewrite my character 25 times until she becomes a heterosexual black girl without papers. I don’t even have agency as an author because in the end, they’ll transform my project into something it wasn’t to begin with. Then I came back to the idea of a fresh-start, which was a documentary – telling myself that at least I’ll be doing something that isn’t fiction. If there’s a question about whether we exist or not, I would make a film with lots of diverse black girls and at least that question would be swept away. AWID: Could you tell us about your activism and how it has informed your movie? AG: There are many things. 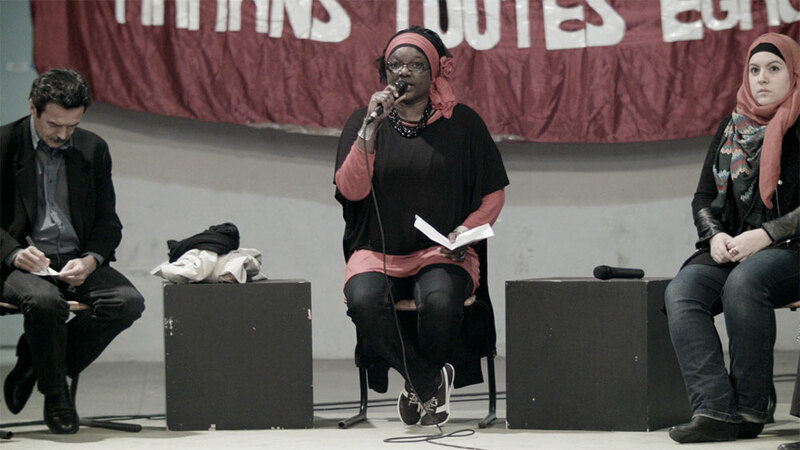 From the moment I decided to create documentaries, I told myself that the biggest problem was that afro-feminism wasn’t a known subject in France, and that I wanted to release an afro-feminist documentary in a context where people didn’t know what it was. As I’d done some studies related to communications, I chose to publicize myself so that we could talk about my film, and really talk about afro-feminist issues – what it is- instead of saying “black feminism” because that’s the post-colonial European perspective. We all come from afro-descendants, so, we include Arabs, because we have a super entangled history and similar experiences of discrimination. So even if it’s an intimate film on black women, for me, afro-feminism is one reminder that it’s not just the history of slavery, there’s also the history of colonization in France and Belgium. What does it mean to be an immigrant or the descendant of immigrants from the colonial history of these countries? I worked as a freelancer and wrote articles for Slate and I covered the story of a big controversy around a show called “Exhibit B” by Brett Bailey, a white South-African director, who created an installation simulating a museum showcasing black people in historic situations being humiliated and dominated. Basically, you could take a stroll through the museum and view silent half-naked black people in chains and, at a national French theatre in Saint-Denis, a city with 80% white people, where this type of thing often took place. It ignited the community, largely populated by black and Arab people, having exhibited a white artist who puts black people in humiliating situations, while they’ve never exhibited any French afro-descendant artists. There was a huge demonstration, we wrote statements, articles. We were insulted in violent ways, accused of being the thought police, etc. We nevertheless produced serious writing and reported on the demonstrations. Finally, Libération published an article titled “L’antiracisme en actes” (Anti-racism in action), which portrayed the discrepancy between the way that afro-descendent communities and French institutional anti-racist groups mobilized against or in favour of Brett Bailey’s show. It still raises questions. If you are part of an anti-racist mobilization, and you find yourself supporting a project that hundreds of black and Arabic people denounce, and demonstrate in front of theatres and you still think you are in the right, it could be that your conception of racism is problematic. There was also a film by Céline Sciama “Girlhood (2014)”which was praised by white French critics. There were a lot of us who hated it, particularly black bloggers, it’s a hyper-miserable, tragic portrayal that inevitably ends up about selling drugs, absent parents, school dropouts, but it was by a lesbian director, so of course it couldn’t be considered regressive. For me, it was the umpteenth suburban film with black people put in a terrible situation where things would clearly end badly. AWID: What are you planning in the long-term? I had to finance my film with my own resources because the National Centre for Cinematography didn’t want to give me the money (why, I don’t know). This allows me to have conversations about how institutions need to finance projects by racialized French people. We also pay taxes. There needs to be a double movement – the first is educating black and Arab people. Not just because it would be nice to be there. It’s really a question of rights. Because we have the same duties as other citizens, we have the same rights, and because we have the same rights, we need to have access to the same things. At the moment, that’s not the case. From a certain point of view, the projects and the visibility I get, and the interventions I can make, are all about social justice. It’s not just about artistic representation. It’s really about respecting our rights and having the means to work under good conditions. I’d like for more and more racialized people to have access to resources, whether artistic or otherwise. My “thing” is art, but it should be the same if you want to be a cabinet maker, or whatever—you should have access to all types of jobs, and that you aren’t systemically oriented toward technical or vocational work that no one wants. The reality is, that’s where we send black and Arab people. You should also know that when you are sent toward these lines of work, that you can say no. You have the right to ask to repeat a school year. You have the right to refuse. You are not condemned to these programs. You have the right to know that when sending you there, it’s a racist reflex. I find that with art, you manage to reach people more, more than violent confrontations where there isn’t much creativity. I’m really interested in profound change.